Samsung UE32H6400 review | What Hi-Fi? Samsung is taking the TV world by storm this year, one set at a time, and this 32in LED from the 6 Series is the latest screen to carry the torch. The UE32H6400 has all the assets of its big brother (the UE40H6400): a natural, detailed picture, wealth of features and smooth interface – but in a smaller package. The only problem is price. At £460, it’s the most expensive set of this size we’ve come across. You can pick up a 40in five-star set – Sony’s KDL-40W605B, for example – for less. If your budget allows it, however, then this is the best performer of the lot. A generous three USB ports are included along with RGB scart, component and audio inputs, as well as optical and headphone outputs. It’s one of the four HDMI inputs, however, that we use to plug in our reference Panasonic Blu-ray player and view Dallas Buyers Club. Unlike many (albeit cheaper) rivals at this size, the Samsung boasts a Full HD panel, meaning it doesn’t have to downscale high-def content. So it should produce good results – and it does. Sharp and crisp, the folds in Matthew McConaughey’s hospital bed pillow and the shading of his cowboy hat are apparent. Depth is good too, and though rich and concentrated, colours remain natural and lifelike. Skin tones are both realistic and warm, while blacks are solid and whites punchy. There’s no blip when it comes to upscaling, either: the Samsung does a great job with DVDs. The dip in quality from Blu-ray is small in images in The Lord of the Rings: The Two Towers, while there’s no dip in broadcast TV either. The picture is just as impressive and colours are striking. Light and clear, the picture is never drowned out by the film’s shadowy settings, and fine detail is never lost. As the camera circles the hobbit’s alpine surroundings, there’s a distinct outline to distant trees. 3D is understandably rare at this level, so we’re surprised to see it in the specs, but it is decent. Harry Potter and the Deathly Hallows: Part 1 (on 3D Blu-ray) comes to life and the effect is smooth and stable. It doesn’t suffer from the lack of brightness common in 3D. 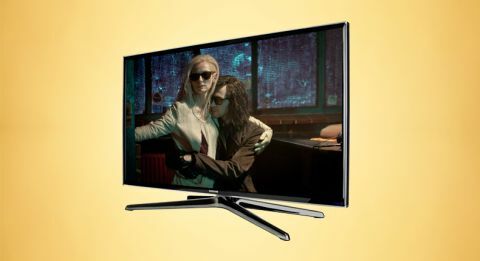 The Samsung has a surprisingly rich, weighty sound – it sets the benchmark for a TV its size. Wind atop the high hills in LOTR has plenty of detail, for example, and the Samsung can go loud. Samsung’s signature glossy-black bezel is here, while the company’s trademark metal stand is good support; it extends front and back, though, so consider your tabletop dimensions. Netflix, YouTube and a web browser join a full set of catch-up services (BBC iPlayer, ITV Player, 4oD and 5 On Demand), as well as BFI Player, Spotify and Eurosport Player for streaming on a seamless, well thought-out interface. A smart remote is supplied as a neat addition to the traditional one. The pebble-shaped tool sits comfortably in the hand and impresses with its accurate pointer and voice commands, but we find the standard controller (which can be set up as a universal remote for your other AV components) the better option. The Smart Hub portal is where you’ll find your apps, games, films and streaming services. ‘On TV’ allows you browse genres, while ‘S Recommendation’ suggests programmes based on your viewing habits. Each page or selection scrolls smoothly to the next, so it’s the real deal when it comes to user experience. The Samsung has everything, but price could be a sticking point. Yet this 32in is a class leader in picture and sound quality and, if your budget suits, then it should be on your shopping list.